On February 19, 1942, Franklin Roosevelt reached the moral low point of his presidency, signing Executive Order 9066. This authorized the internment of Japanese Americans in flagrant violation of the Constitution and our best national values. 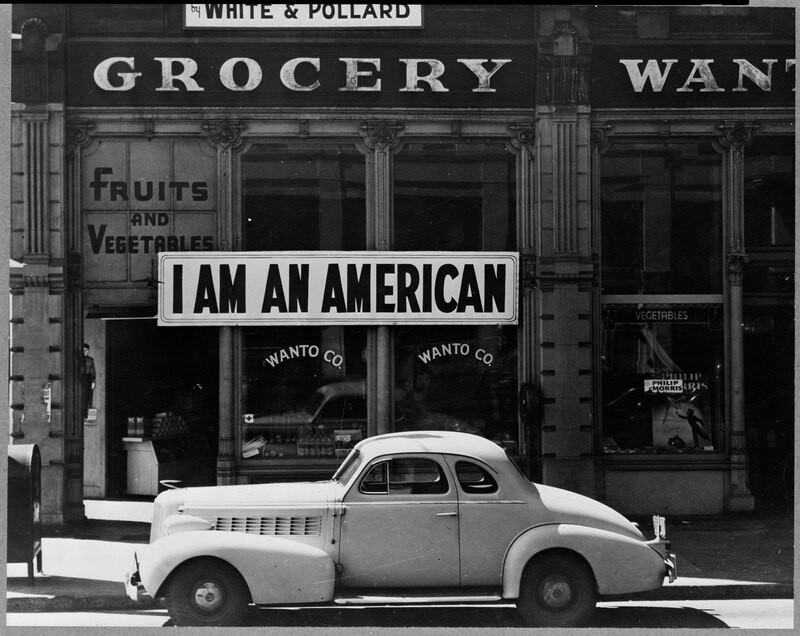 Public hysteria to expel or deport Japanese-Americans rested on racial paranoia and resentment partly rooted in the competitive success of Japanese Americans in California and other western states. Yeah, Jewish readers would find much of the popular discourse–not to mention various sundry details regarding neighbors’ theft of property belonging to interned families–rather chilling in its familiarity. An amazing exhibit at the Japanese American national museum details much of this history. It is worth a visit. President Trump is the most comprehensively unworthy man to occupy the Oval Office in modern American history. Yet far better men perpetrated worse injustices than we have seen thus far in the Trump administration. As Keith rightly notes in the first comment below, Earl Warren and many others supported the Japanese internment. Most other Americans acquiesced with their silence. Hopefully, our society and basic institutions learned from these experiences and failures, and will step up to resist contemporary injustices. If memory serves, the key state level advocate of this was Earl Warren, later a liberal SCOTUS justice. "Hopefully, our society and basic institutions learned from these experiences and failures, and will step up to resist contemporary injustices." Cf., Gitmo, enhanced interrogation, the recent H.J Resolution 69, or the ever-popular North Carolina law, House Bill 2 (2016); also, of course, numerous voter suppression laws around the country. "This authorized the internment of Japanese Americans in flagrant violation of the Constitution…"
Not according to the 6 people that actually get to say if it violates the Constitution. 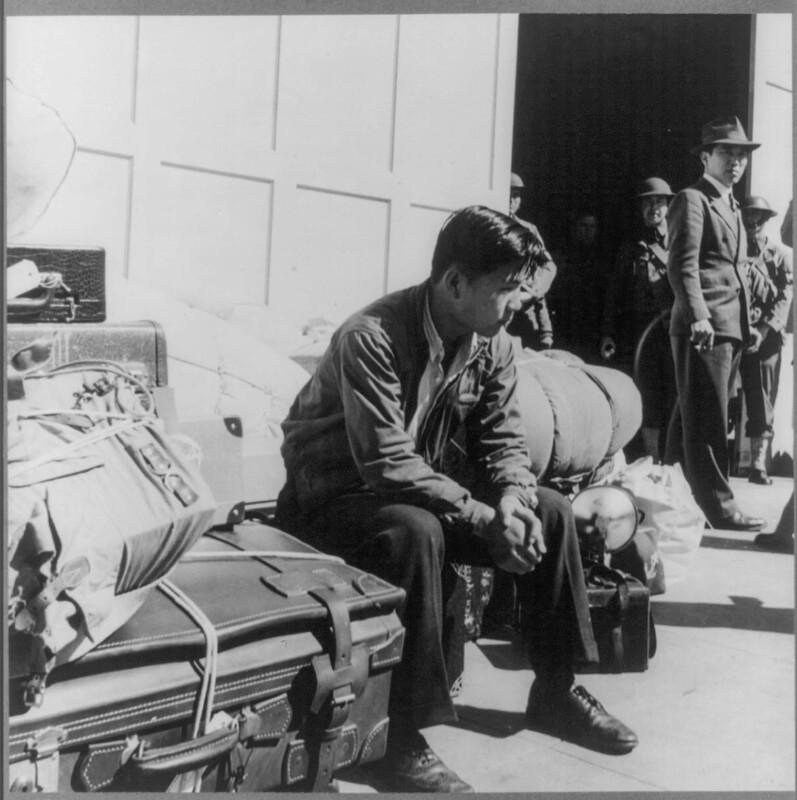 One remarkable thing about the internment, that I think is relevant to current debates about refugees, is that being treated like criminals and uprooted from their lives did not make Japanese-Americans any less patriotic. Many, of course, served in WWII, heroically, risking their lives for a country that treated them shabbily, and imprisoned their friends and neighbors for a stupid reason. To me, this shows why we have so little to fear from refugees and immigrants. Immigrants come here for a reason – the same reasons we cite when we talk about American exceptionalism. Having worked so hard to get here, they appreciate every scrap of decency or opportunity that comes their way. Refugees don't have the same choice, but I'm pretty sure most are grateful to escape the shadow of death to come to a place where life can be pretty darn hard, even for folks born and raised here, but that offers some measure of freedom, safety and opportunity. Of course, many immigrants, and even desperate refugees don't just survive here, but thrive. If anyone is likely to hate America, commit crimes and abuse women, I think it's more likely to be a resentful layabout from, say, Queens, who hates the fact that money isn't enough to buy him respect, that he never measured up to his father, and sees all kinds of losers getting a leg up through hard work and creativity instead of being born into privilege, the way it's supposed to work (in his warped view). Funny how economic insecurity makes some folks work hard, raise their kids to be decent and contribute to their communities, while it makes others sick, twisted, bigoted, resentful and a threat to the entire world. I know that you mean well, but it insults refugees and immigrants even to defend them from haters such as Trump. No reasonable person thinks we have anything to fear from them, so to offer reasons why we shouldn't fear them is to dignify the bigotry of Trump and his supporters. It may be that no reasonable people think this, but a hell of a lot of people do think it, and with no pushback the hate-propaganda just spreads and spreads. A lot of Americans have never knowingly met a Muslim immigrant, or have only seen them fleetingly in public. It makes it much easier to believe stories about how they're all violent fundamentalists, rapists and rioters. Two things. First Jarndyce's definition of "reasonable people" is circular, defined apparently as "only those who do not think we have anything to fear from refugees and immigrants." Bear in mind that many otherwise reasonable people live in situations where they interact with only a limited group of people and may get limited or skewed information. Many people pay very little attention to things that are not in their immediate purview. They are not, however, incapable of reason, and a coherent argument may indeed contribute to their changing their views. It is, for this reason, worth being aware of the range of arguments supporting your own position. And that gets me to the second point. Reviewing arguments in favor of one's position is a good thing. Snideissue didn't say anything I wasn't already aware of, but, as someone who frequently interacts with people whose views are uninformed and not particularly thought through, I'm glad to be reminded of that argument, especially in the clear and coherent fashion in which Snideissue presented it. It's a good thing to keep in mind, and I suspect I'll be glad to have it in the front of my mind before many days have passed. Thanks for your reply. It's better than the one I was working on. I do take Jarndyce's point. There's a fine line between the patronizing tone of "aren't these people such good Americans" and the argument I was trying to make – an appeal to the better angels of decent people available to be persuaded, perhaps with a little schmaltz on top. Plus, this may be the first time I've ever used "patriotic" as a compliment. I'm all for patriotism, but there a lot more ways to be patriotic than uncritical love for the US, which is the main thing people who over-use the word are talking about. Indeed, the best thing about a patriot like George Takei is that he's trying to make the country that mistreated him as a child (and is still not paradise for LGBT folks) live up to its ideals. That's almost as impressive as wearing a flag pin on your lapel! In the right wing universe, the world is full of whiners and complainers whose resentment for their fate (a fate entirely deserved in said universe, and certainly not the result of any action or inaction of the privileged) undermines their work ethic and morals. In my experience it's just the opposite. The flag pin wearers marinate in resentment and cook up fears out of thin air, forgoing the slightly difficult work of empathy and introspection in favor of the far easier path of self-pity and scapegoating. Sad! Re: "many otherwise reasonable people"
Once upon a time (31yr ago) I was a homophobe. I believed that gay people should be allowed to live their lives, but I thought their existence was fundamentally "icky" (Can't come up with a better word). Then a very close friend came out to me. So I did the math: "he's not icky; he's gay; therefore, not all gay people are icky; and since he's the only one I know, I have no evidence that gay people are icky; I should not think they're icky". So …. well, yeah, I think it's worth the effort to show people that immigrants aren't the stuff of CPAC nightmares. That said, I was already a rather liberal person. So …. I have my doubts as to how effective these techniques will be, on Trumpists. Still worth trying. Your discovery that a close friend was gay but not icky does not demonstrate that you would have changed if someone had argued to you that gay people are not icky. The analogy is an anti-Muslim bigot learning that a close friend is a Muslim immigrant: That might change him, whereas arguments might not. Having said that, I acknowledge the points made by the other commenters that arguments might work. I also appreciate snideissue's taking my point that such arguments can cross the line to being insulting. Just one small quibble: Pace lcoleman6, my definition of "reasonable people" was not circular, because I did not define "reasonable people." When I said that no reasonable person will fear refugees and immigrants, I meant merely that fearing refugees and immigrants is not reasonable, and I should have expressed that more clearly. Obviously, a person who fears refugees and immigrants might be capable of reason (he might be a mathematician, say), and so I agree with lcoleman6 that a coherent argument might contribute to changing a bigot's views. I am glad that I raised this issue, and thank the commenters for their thoughts on it. Thank you. Points well taken. I think what I was trying to get at with my reference to circularity is just what you said: absent a definition, it looked to me as if the term was self-defining. In any case, I think we agree. Since antiscience has provided the basis for their belief, I'll provide (some of) mine. As it happens, I teach material that a good many students are predisposed against, and, like many teachers, I suspect, I do regularly see the positive effect of reasoned argument. I don't think it often happens instantly–people need time to get used to new ideas. But if people are exposed to argument over time, they can change their minds. (Not always, sadly, in the right direction, but that's another issue.) And I've changed my mind about a few things as a result of encountering reasoned and coherent arguments.